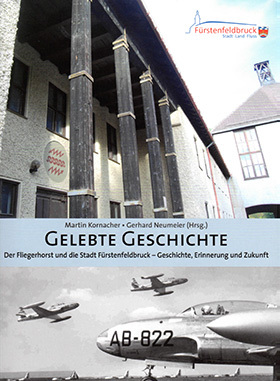 With the dis­con­ti­nua­ti­on of the mili­ta­ry use at the air base, not only almost 80 years of tra­di­ti­on but also an equal­ly long‐lasting com­mon histo­ry of the base and the town of Fürs­ten­feld­bruck are com­ing to a clo­se. Sin­ce con­struc­tion work star­ted in 1935, the sol­di­ers of the Wehr­macht (Armed Forces of Nazi Ger­ma­ny), of the US Air Force and, from 1956 onwards, of the Ger­man Luft­waf­fe (Air Force) who were sta­tio­ned the­re, have hel­ped shape the life in town. Memo­ries of the com­mon histo­ry are to be pre­ser­ved for next genera­ti­ons. For this rea­son, a sym­po­si­um was con­duc­ted in May 2014 pro­vi­ding initi­al food for thought on how to con­cep­tual­ly rea­li­ze this idea in twel­ve lec­tures, ele­ven of which are published in the book “Geleb­te Geschich­te. Der Flie­ger­horst und die Stadt Fürs­ten­feld­bruck – Geschich­te, Erin­ne­rung und Zukunft” (“Living Histo­ry. The air base and the town of Fürs­ten­feld­bruck – histo­ry, memo­ry and future”). A second edi­ti­on of the book published by Mar­tin Kornacher, head of the muni­ci­pal plan­ning and buil­ding con­trol office, and muni­ci­pal archi­vist Dr Ger­hard Neu­mei­er and com­mis­sio­ned by Fürs­ten­feld­bruck town admi­nis­tra­ti­on has just been released.